The latest in Bangladesh’s seemingly never-ending supply of left-arm spinners, Abdur Razzaq (no relation to the similarly named Pakistan allrounder) made his mark when he helped unheralded Khulna to their first-ever National Cricket League title in 2001-02. Tall, with a high action, he was also instrumental in Victoria Sporting Club’s surprise triumph in the 2002-03 Dhaka Premier Division. 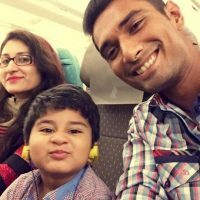 He was given his A-team debut during the five-match one-day series against Zimbabwe early in 2004, and took the opportunity well with 15 wickets, including a matchwinning 7 for 17 in the third encounter on the batting paradise of Dhaka’s Bangabandhu National Stadium. 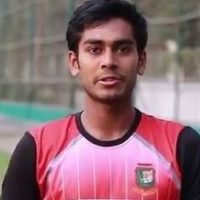 He has an uncanny ability to pin batsmen down, although the position of his bowling arm during delivery is a worry, and his action has been reported in the past. Bangladesh’s coaching staff are using video technology to help iron out anything suspicious. He took 3 for 17 on his one-day debut against Hong Kong in the Asia Cup in Colombo in 2004, but was reported for a suspect action after the next match, against Pakistan. 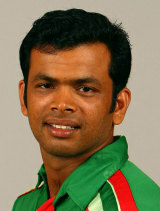 Left out of the Champions Trophy in England later that year, “Raj” played just one ODI – against Zimbabwe in January 2005 – before he was recalled for the home series against Sri Lanka in February 2006. 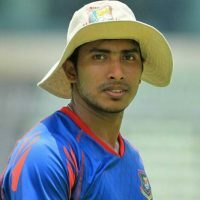 He made his Test debut two months later, called up for the second Test against Australia on a turning track at Chittagong (even the Aussies played three spinners), but failed to take a wicket. He has, however, become a regular in the one-day team and his parsimonious left-arm spin was effective in the Champions Trophy in October. Razzak achieved his career-best figures of 5 for 33 against Zimbabwe in December 2006. In 2008 he was reported for a suspect action again and this time an independent analysis found that he bent his arm up to 28 degrees – 13 more than the permissible limit. He was suspended from bowling in international cricket. The ICC cleared him the following year and soon after, was picked for the World Twenty20 in England.